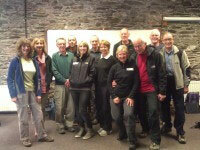 Please email or phone Andrea on 07818 258 799 to book a first aid training course for your group. These first aid courses are delivered at your venue for up to 12 participants per trainer. Invoices and certificates will be sent to one central contact in the business or group. Bookings for corporate and group courses are charged at a basic rate for trainer time, travel, insurance and use of equipment for the course to run. If you require an accredited first aid qualification (i.e. Emergency First Aid at Work) then an additional fee per student applies which includes admin costs and the fee we pay to the awarding body ITC for your certificate and course manual. So if you have 10 people at the time of booking and only 8 turn up on the day, we will not charge you for certificates not issued. Please note that certificates will only be issued after payment has been received in full. If you only need 1 or 2 spaces you can book on one of our open courses or get in touch direct as sometimes we have individual spaces available on corporate/group courses.